I'm joining a few different reading challenges this year! I'm hoping that in 2018 I will read more 4- to 5-star books and fewer 3-star ones. Maybe I need to DNF more? Or perhaps I just had bad luck in 2017. Anne also provides some printables when you sign up, including a bookmark to track how often you're reading. Guys, I have a number of series that have just... stalled. I've got to either finish them up or decide for sure that I'm going to quit on them. - the Matched series by Ally Condie — I have Reached, I got most of the way through Reached, and then... I dunno, it really wasn't doing it for me at that moment so I put it down. It may have been my mood, though, as I was in the midst of an intense Master's program and my reading for fun just fizzled. I liked Matched and Crossed, so I feel like I should give Reached another try. - the His Fair Assassin series by Robin LaFevers — I've read the first two. I really liked Grave Mercy but was more kinda lukewarm on Dark Triumph. I have a copy of Mortal Heart so I need to get to it! - the Birthmarked series by Caragh O'Brien — I read the first book forever ago. I think I'd need to re-read before I started on Prized, but I do have a copy of both of those so I could do that. How I feel about Prized will probably determine if I keep going with the series. - the Razorland series by Ann Aguirre — I read Enclave AS AN ARC, that is how long ago I read it. And I've had Outpost sitting on my TBR shelves for... an embarrassingly long time. This is another one where I think I'll need to skim the first book as a refresher first. - the Chemical Garden trilogy by Lauren DeStefano — I've read and have copies of Wither and Fever, but it's not my favourite series. Still, I kinda want to know how it ends... thoughts? - the Nevermore series by Kelly Creagh — I read Nevermore so. long. ago. But I did enjoy it and although I'd need to get the first out of the library to refresh my memory, I own the second now, so... yeah, I need to get to that already. 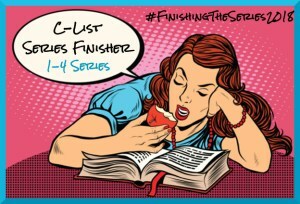 I'm picking the lowest level "C-List Series Finisher," as I really doubt I will finish reading more than 4 series this year. This is a challenge for reading books that you already owned before January 1, 2018. I have so many of these that I badly need to just get read, already! 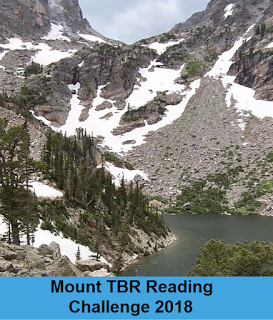 I'm going to just pick the lowest level, Pike's Peak (12 books) to start with, although I'm hoping I might get to Mount Blanc (24 books). What challenges are you participating in this year? Which books do you think I should read for the challenges I've signed up for? Let me know your recommendations! These looks like great challenges to participate in. I especially love the idea of the first two challenges. Good luck! I hope you have fun! 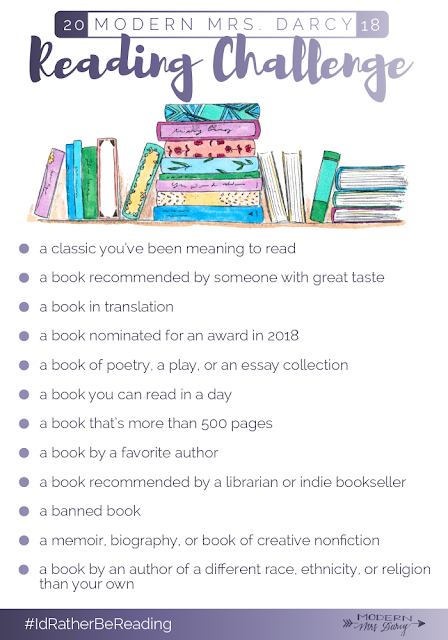 These look like some fun challenges and helpful at getting to those books that are calling out to be read. Good luck!